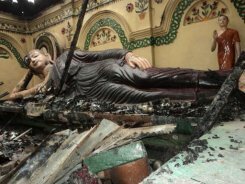 Dhaka, Bangladesh -- A high-level government committee has accused activists of ruling Awami League alongside main opposition BNP and fundamentalist Jamaat-e-Islami (JI) for the attack on Buddhist temples and localities in south-eastern Bangladesh last month, reports said today. Authorities have declined to "officially" immediately reveal, the probe body findings as it submitted the report to the home ministry only yesterday but several newspapers quoting sources familiar with the investigation said the government committee identified 205 people behind the September 29-30 attacks in Ramu and adjoining areas. "Most of them (205 suspects) are local leaders and activists of Jamaat, BNP and Awami League" in Ramu sub-district and adjoining areas in Cox's Bazar, the mass circulation Prothom Alo newspaper reported. The report said the attack on the intervening night of September 29 and 30 was preceded by a secret meeting at the residence of a JI leader Tofail Ahmed, a piece of information that substantiated the finding of a separate investigation by Supreme Court lawyers. The report also accused the local administration and police of failure to prevent the attacks, while it came as parallel police investigations are underway with law enforcement agencies so far arresting over 200 suspects. Incensed apparently by a Facebook posting allegedly by a follower of the Buddhist faith, the miscreants had instigated local Muslims to torch 11 Buddhist temples, damage two others and ransack some 30 houses in Buddhist neighbourhoods. The Samakal newspaper also carried a report on the findings but said the committee could not unmask behind-the-scene patrons of the attack though it suspected infighting in local Awami League leadership largely allowed culprits to stage the attack. Meanwhile, the lawyers investigations observed that the attack was carried out to destabilise the country and tarnish its image before the world and neighbouring countries including Buddhist-majority Myanmar, Sri Lanka and China. Bangladesh's High Court today demanded a government explanation for "inaction" in preventing the attacks. The order came in response to two writ petitions by a Buddhist lawyer and another Muslim alleging that the local police administration did not take any steps to prevent the attacks, a situation that later prompted authorities to "withdraw and close" the local police station. Prime Minister Sheikh Hasina has ordered immediate steps for exemplary punishment of the perpetrators. The government has also allocated cash amounts for the affected and promised to rebuild the temples and houses with government money.